Blossom end rot is a common tomato problem associated with growing conditions. It affects tomato fruit. Stems and leaves show no symptoms. What does blossom end rot (BER) look like? The bottom side of the tomato (either a green or ripened one) develops a sunken, leathery dark brown or black spot. Gardeners most often notice BER when fruit is 1/3 to 1/2 its full size. A tomato’s cells need calcium to grow. Calcium acts like glue in cells – it binds them together. Tomatoes absorb calcium through water. But calcium isn’t fast-moving. If a tomato grows quickly, or if other conditions slow water absorption, then calcium doesn’t have enough time to travel through the whole piece of fruit. Plants can’t absorb enough calcium – whether or not there’s enough in the soil. A tomato’s tissues break down and leave the telltale damage on its bottom. When does blossom end rot affect plants? How can you control and treat blossom end rot? Prevention is the most method of control (see below). 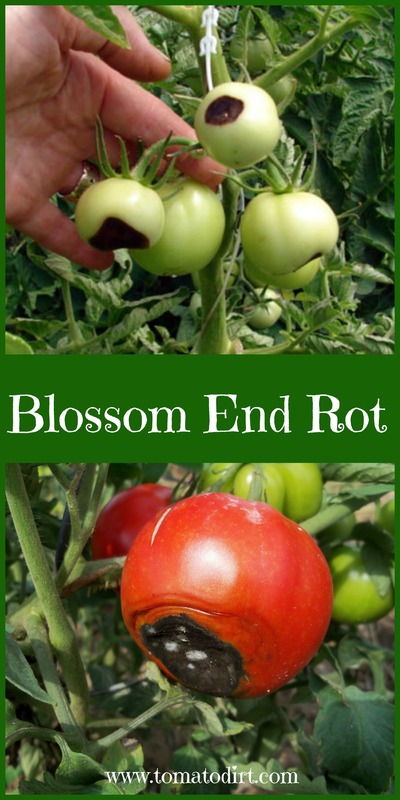 Blossom end rot cannot be reversed on a tomato once it’s set in, but you can take these steps to slow and halt it. Pick affected fruit to reduce stress on the plant and allow it to direct its energy to other tomatoes. Cut out spots on harvested fruit and eat remainder. Blossom end rot does not make the rest of the tomato inedible. However, if tomatoes have been infected by fungi or mold, discard them. How can you prevent blossom end rot? There are lots of ways you can take precautions for next year's crop! Carefully harden off young seedlings gradually to protect them from extreme temperatures and conditions. Select a planting area with good drainage. Avoid setting out plants too early in the season, which can expose them to cold temperatures and cold soil. Allow soil to warm before planting. Work in plenty of compost and organic matter into the soil before planting, so that the plant’s root system has a better chance to grow strong and deep. Add quick-release lime when planting tomatoes so that there’s plenty of calcium in the soil and it’s absorbed quickly. Tomatoes grow best when the soil pH is about 6.5. Keep your tomatoes’ water supply even throughout the season so that calcium uptake is regular. Tomatoes need 1-3 inches of water a week. They perform best when watered deeply a couple of times a week rather than superficially every day. Mulch plants once established to maintain moisture levels. Once blossoms emerge, apply tomato fertilizer that is high in phosphorus (the second number in a fertilizer’s three-number series), like 4-12-4 or 5-20-5. Too much nitrogen (the first number) or large amounts of fresh manure can prevent calcium uptake. Cultivate carefully around tomato plants to avoid damaging root systems. Try not to dig more than an inch or two deep around plants. Determinate tomato varieties are more prone to BER because they set fruit in a short period of time. Indeterminates and semi-determinates set fruit throughout the season, making it easier for plants to regulate calcium intake. BER also affects eggplant, peppers, squash, and watermelon. See more examples of Blossom End Rot on our Pinterest Board.